Here are 10 websites that let you roll virtual dice online. Just go to the websites and do the dice roll. 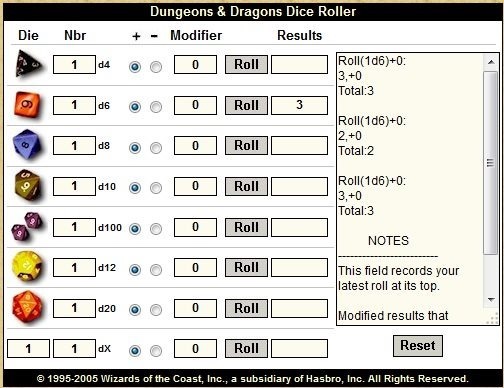 Some of these websites give good graphics as well of dice roll, while some just show final results of the roll. Before I started working on this article, my understanding of dice roll was simply one or two dices rolled together, with each dice having numbers from 1 to 6. However, while researching for this article, I came across many websites that support many different type of dice and gave pretty complex combination to roll the dices. Then I read about it on Wikipedia, and surely, the dice I knew was just a small subset of amazing world of Dice :). Random.org is one of my favorite sites, because it has so many useful utilities. We have already covered it to randomize elements in a list, as well as for virtual coin toss. 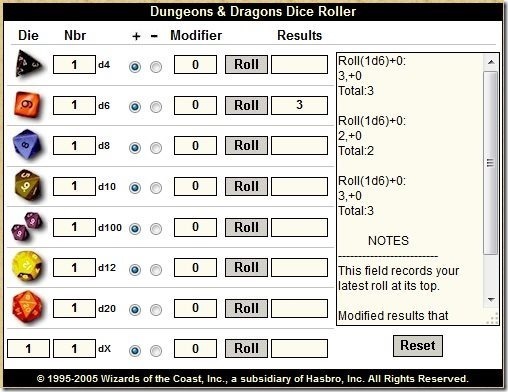 This website also has a nice Dice roller that lets you do virtual dice roll online. This is another simple virtual dice roll website. Just select number of dice that you want to roll, and proceed with dice roll. 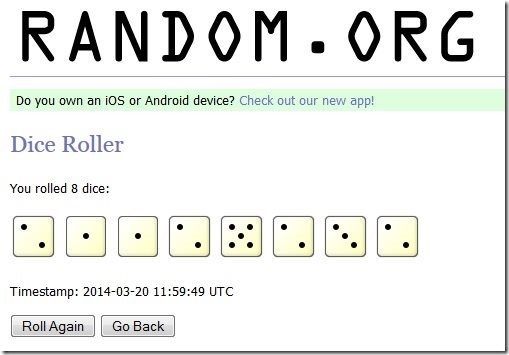 This is a simple website that lets you roll one or two dices. 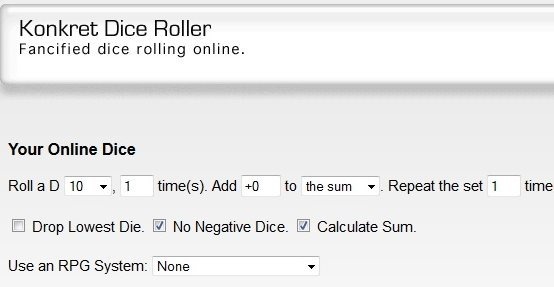 Saint Ann’s School has setup a very simple dice roller online. It lets you roll two dices only. One additional feature it provides is that it shows previous results also, but in a way that you can only know how many times a particular result came, and not necessarily sequence of results. 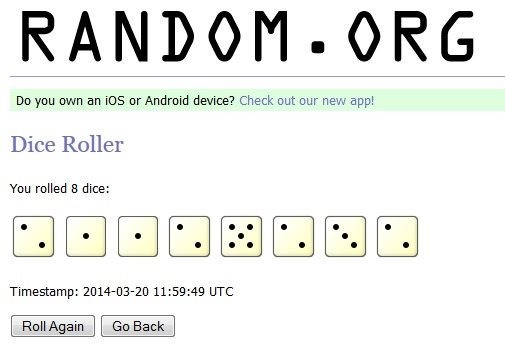 This website lets you roll just one dice. However, as compared to the websites mentioned above, it has a unique feature that it lets you select number of faces on dice. Your dice can have 6 faces, 8 faces, 10 faces, or 12 faces. This website is last in our list of simple online virtual dice rollers. 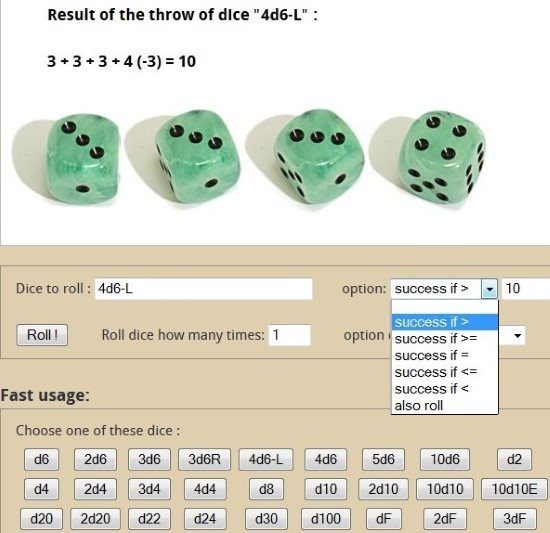 As with all the websites above, it lets you choose number of dice and roll them. Now, let’s move on to some more complicated websites that provide tricky dice rolls online. This website does not looks pretty, but frankly, this is my favorite website on the list. It lets you choose from among a large number of dice types, with number of faces as: 4, 6, 8, 10, 100, 12, 20. Also, you can choose different number of dices and add modifiers to the results. Final results are shown in the column on right side and you can see previous results as well. It might take some time to get used to this, but once you do, you will surely like it. Konkret dice roller is another advanced online virtual dice roller. Unlike other websites on this list, this one does not even show any dice. Instead, you have to specify exactly how many faces your dice should have, how many dices you want to roll, what number do you want to add to sum or each die, and how many times you want to repeat the entire set. It also gives option to drop lowest die. And shows of last 10 rolls as well. Hamete Virtual Dice Server things to even next level. It provides lot of different dice, like, d6, 2d6, 3d6r, 4d6-L, d10, d24, 10d10E, and many more (if you didn’t understand what these notations mean, probably you don’t need such a complicated dice roller; stick to the first six of this post). In addition to this, you can also specify your own dice to roll. You can also specify how many times you want to roll the dice. This website is primarily useful for dice roll for RPG and PBEM games. Rolz.org is another advanced online dice roller. 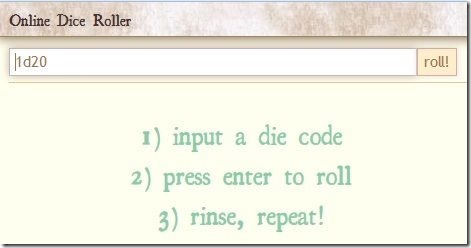 You need to input die code and hit roll button to see the result. It also shows previous results. Some of the things it supports include: take the highest, take the lowest, drop the lowest, fudge rolls, Hero system, wild die, Take X highest rolls, Unique rolls, etc. 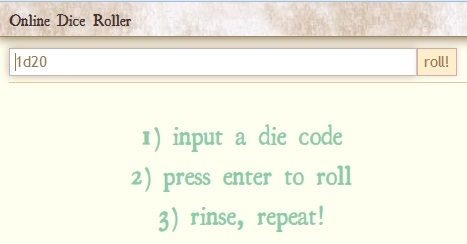 As long as you can make a valid die code, you can use this website to roll the die. 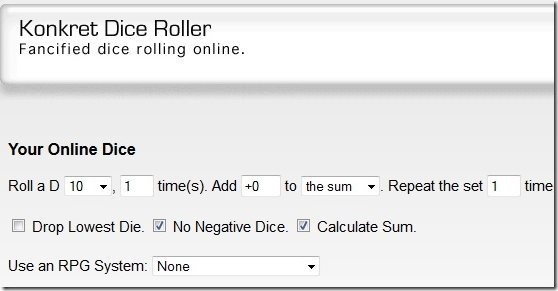 This concludes this list of 10 online websites to do virtual dice roll. Researching for this article was quite enlightening for me as I realized world of dice is quite huge, and not just limited to two dice with 6 faces. Try these websites if you need to roll a dice but do not have one.